'Cellular Streams' to Light Up Venice Canals Tonight! - Yo! Venice! 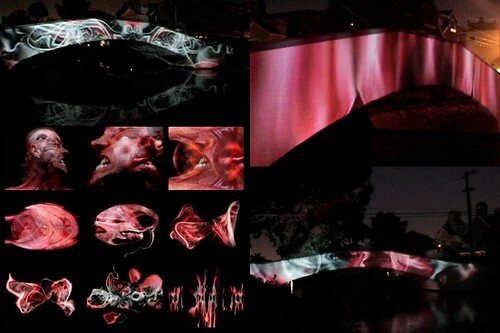 Home Venice Beach Art ‘Cellular Streams’ to Light Up Venice Canals Tonight! ‘Cellular Streams’ to Light Up Venice Canals Tonight! Ceci n’est pas • Art Between France and Los Angeles • will host “Cellular Streams”, an audio video site specific installation from Marianne Magne‘s ongoing ”Transitory Conditions” series this evening from 7-10pm on Howland Canal at the Dell bridge. The last time Magne did this on Howland was in 2005 (video), and it was very cool! (Pictures from that event are used in the rotating images at the top of Yo! Venice!) Definitely worth walking or biking by at some point to check out! The project “will encompass a video projection on the west side of the bridge in an audio environment. The installation permutes the stone ridge into a biological arch. A red and grey video flow bridges the left and right bank of the canal, a metaphor for the subcutaneous currents that feed our brain and body: nervous path, lymphatic system, red and white cells, grey matter, synapses and chromosomes. Overlapping pathways ceaselessly carry information to participate in the left and right hemisphere connections. The piece alludes to our internal connectivity and its perpetual change, our organic and impermanent nature”. The accompanying soundscape was compiled from Ockham’s Razor [D.Day and A.Perich] tracks, mixed and edited by Magne. “Ceci n’est pas” is a city wide event supported by the French Consulate.